What is Free Burger Day? Free Burger Day is our way of showing you, the North Charleston Community, that we have the BEST burgers in town! We will be offering FREE burgers with any purchase for anyone who signs up for our text list (instructions below). We are preparing to give away 2,000 burgers and to close our line at 9 PM. When is Free Burger Day? Free Burger Day will be held on Thursday, February 14th... as some like to call it, Valentine’s Day! We'll open at 11 AM and close the line at 9PM (OR earlier once we have given away 2,000 burgers). 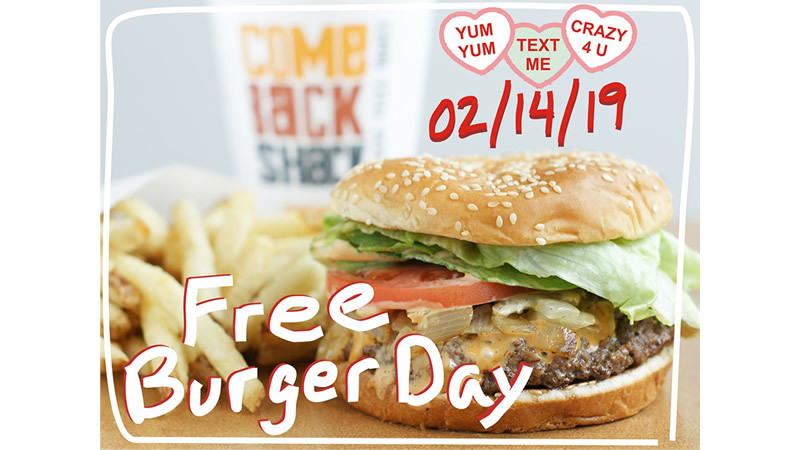 What locations are serving Free Burgers on Valentine’s Day (02/14/19)? Free Burger Day will only be happening at our North Charleston location. How do I participate in Free Burger Day? To participate, all you need to do is be on our text list and make any purchase! It’s really that easy. What counts as a purchase? A drink, fries, a shake, another burger, etc. A cup of water--nah, that's free today! How to I sign up for the text list? To join our text list is really easy (and you don’t even need a smartphone)! All you have to do is text the phrase “shackchas” to 86677 and follow the simple instructions. In order to participate in Free Burger Day, you MUST sign up or already be on our text list. Why does Come Back Shack have the BEST Burgers? Our burgers are fresh, never frozen 100% USDA ground chuck, pattied by hand every day. We add no fillers, no preservatives, and no scary ingredients. The burgers are grilled to perfection and served to order, making them hot, juicy, and delicious. How many Free Burgers can I get on Free Burger Day? You can only get one Free Burger per text message on Free Burger Day. What menu items will be available on Free Burger Day? All of our sides, drinks, shakes, and slushies will be available on Free Burger Day. Our menu on this day will NOT include the following: grilled chicken, chicken tenders, Local burgers, turkey burgers, vegetarian burgers, Nathan's hotdogs, tuna, and salads. What will happen when you have given away all 2,000 Free Burgers? Once we have given away 2,000 burgers, our doors will close. Make sure you arrive before we run out, so you can get one of our AWESOME burgers for free! If I show up after you have given away 2,000 Free Burgers, can I get a raincheck? No, our event is over when we have given away all 2,000 of our Free Burgers. But, if you’re signed up for our text list, we do send out promotions throughout the year for other fun discounts and promotions! What if I want to substitute my Free Burger for a vegetarian burger? We will not be serving any other protein on Free Burger Day besides our 100% USDA chuck patties. Please come by any other day for one of our delicious vegetarian burgers! What toppings can I get on my Free Burger? You can get your burger styled anyway you want it! Our only stipulation is that premium toppings will still cost extra. Premium toppings are: cheese, bacon, fried green tomatoes, and avocado. If I have a Gluten Allergy, will there be options available to me? Yes, we will still be offering our lettuce-wraps on Free Burger Day. What if I have a food allergy (not gluten)? Will I be able to get a Free Burger through the drive-thru? Yes, on Free Burger Day, our drive-thru will be open as usual. If my children don’t have a phone, can they still get a Free Burger?